"Are you sitting comfortably? Then I will begin"....the opening of "Listen with mother"; the radio programme that reaches back into my childhood. To be honest I have no recollection of sitting down to listen to it, but the phrase conjures up such strong associations I must have listened in; at least now and again. "Tell me a story" is a phrase from my own children's childhood and it guaranteed cuddles on the sofa and time suspended. Those are precious memories but also speak of a society that confines storytelling to childhood. But in truth stories are how we construct our world at any age; our self- beliefs, our organisations, even our nations. How often we perceive ourselves through those stories; I was the naughty child or the good one, I was the clever one, the challenging adolescent, the moody one, the fun one and those definitions stalk us into adulthood. A delicate story is woven around us and we can find ourselves playing it out for all of lives for good or ill. 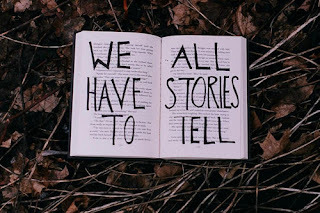 But what if that story is of illness, of abuse, or neglect, of lack of love....do we need to carry those stories too? In our recent and powerful masterclass on storytelling by Marie Ennis O'Connor helped us understand the power of stories in our lives; how we are hot wired to make sense of our world though story and that is true of all cultures. Our stories can serve us well of course, they can be positive and life enhancing but they can also be negative and limit our belief. But we are not our stories, we can change them and find a different way to relate to them. But perhaps first we have to recognise them, to tell them and to have someone bear witness to them too. My blog has been a vehicle for my story over the last few years. It's been a vehicle for my ups and downs, my bumps in the road and cul-de-sacs too. It's been a cathartic release, a place to shed tears and happily also share joy. And it's held the boundary of what I have felt able to share, the gap between me and the story. It's helped me retain a sense of myself as separate from my illness, the experience of cancer and allowed me to leave it on these pages and get on with living. Storytelling in health and social care can help us relate to the impact of illness, to know how experiences impact, to understand how services work in a way that statistics never could. But the masterclass identified the importance of the story being acknowledged, being heard. And can we truly say those stories really change services? Are they sanitised into neat boxes and only allowed to reinforce our existing stories after all? The culture of healthcare remains remarkably intact in spite of a body of knowledge that points to the need to change. So perhaps it's time to look at the stories we tell ourselves, listen to those who are telling us clearly about what matters to them and start to weave some different stories, that speak of a service that listens, that cares, that works with people as partners in their care, that puts health and wellbeing at the core of its focus. We can learn to deeply listen to the stories we are told and that we tell ourselves and, importantly, we can change those stories for ourselves, for our organisation and for our culture as a nation even. Brene Brown describes stories as data with a soul, what could be more important than that? Can coaching approaches transform care systems? When we think of transforming health and social care, what comes to mind first? Perhaps it's the hi-tech things like robots doing delicate surgery or delivering routine care with cool efficiency; maybe it's gene therapy to enable us to prevent or treat tragic inherited conditions, even medicines unthought of to provide cures we don't dare hope for yet. And I expect some of that will indeed define part of the future, depending on cost. But would that really be so transformational for most of us, who live with more common conditions, who have perhaps slowly and gradually learned that no magic cure will change our lives? Yes, medicines and treatments might make a difference but even the so called "cures" leave their impact on long term wellbeing. And ultimately it's wellbeing we seek. In the modern world we have learned to seek quick fixes, we look for solutions outside of ourselves and we get angry when that doesn't arrive. What an exhausting, soul destroying process that can be. you to keep you well and then to organise the services and treatments offered to enable this, to sign post, to connect and indeed sometimes to get out the way. Transformed services as I understand it will have the individual, their family and community at the centre and services will be part of several options to support wellbeing. That will create a very different engagement with services and within ourselves too. That won't happen without learning to do things differently. Particularly in healthcare, we currently train staff in a fix-it model, with the professional in the role of expert and the service user as passive recipient. We all need to learn to do this differently. My experience in this field has taught me that a coaching approach will be an important part of this transformation. Developing person centred coaches is a vital part of enabling this transformation to happen, both in individuals and within the health and care systems. the potential for growth and transformation, it is asset-based and person-centred at its core and is life enhancing for those involved. One such example is an eight week course I have developed, building on my wide experience and learning from projects like the Esther network in Sweden and Buurtzorg in Holland aimed at developing coaches and supporting a person-centred integrated health and care service. Participants report this work is life changing and inspiring, they feel less stressed, more resilient as managers and practitioners, they have already achieved significant impacts through their change projects and ultimately learn the key is in relationship not just with others but with yourself. As one person said they have person-centredness in their DNA. So if you ask me how do you transform health and care services, my answer is develop people to build their awareness, their active listening, their deep understanding of person centredness and improve their resilience; make person-centred coaching the linchpin of our future services and we won't just improve the wellbeing of those receiving care, we will improve it for staff as well. Independent Coach and Consultant in Health and Social Care and Associate Director of the Health and Social Care Academy. I think its fair to say blogging has changed my life. It's also brought new friends and I'm so delighted to play a part in bring the very special Marie Ennis-O'Connor to Edinburgh and talk about how stories can change the world. Please come and join us, and change how you use stories too.